When you create a piece of artwork you hold the copyright. The law states that the minute you have created you artwork, or lay pen to paper, that it belongs to you, but even then only three changes need to be made to your design for it to be sufficiently different to not be classed as copyright infringement. However, if you actually design a product for the market that can be copied, such a corkscrew, you may need to apply for a patent to protect your work. You can even add your own trademark to your work to protect it, should you wish. For normal pieces of art, unless you are famous, no one really tends to copy it. For painters that copy the work of old masters it is normally ok because the copyright of a work only usually lasts for seventy years after the death of the artist – unless it belongs to a museum and they have copyrighted the image for use on their promotional material, but normally you can see artists sitting in museums trying their hand at imitating the old works of art. The easiest way to copyright your work yourself, with little or no cost, is to photograph and catalogue it. Each photograph will be date stamped on your computer enabling you to easily prove that you created the work first. Make sure that when you create the catalogue disk that you put a written file on it with the titles and dates of the works, this document too will be date stamped. 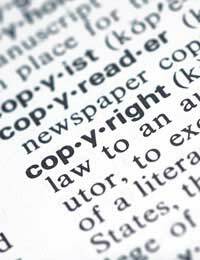 There are also some internet sites that offer copyright protection on your work. How they operate is to accept photographic files of your work, they time and date stamp them and give you a certificate proving copyright belongs to you. You choose a length that you want the work protected for, normally ten years, and then pay a set amount. Should your work then be copied you can take legal action because you will have proof that you created the work first as the copyright company will give you all the documents you need to prove when you lodged the work with them along with a copy of the copyrighted work. It's not as official as copyrighting your work through the proper channels, but it is a lot cheaper considering that copyright infringement is a grey area and difficult to prove. You own the copyright the minute the work is created and unless you're famous your work is highly unlikely to be copied. Save yourself a lot of money and don't bother paying for copyright services, as long as you photograph and catalogue your work (something you should do for stock and insurance purposes anyway) you are fairly safe form suffering copyright infringement. Enjoy your work and think of it more as a compliment if someone thinks your work worth copying, rather than a huge problem that needs legal action. Of course there are times, such as if that person then goes on to sell copies of your work, that you will need to follow it through with the help of a solicitor, but even then a letter is normally enough to persuade the person to stop. Thank you for all that wonderful info you have on here, it is very helpful. I have been painting for close to 30yrs now and have shown in solos, groups, received awards over the yrs and this year I decided to take my work on a tour. To date I have taken my traveling show to 4 galleries in North Eastern Ontario and works are back home until next yr when touring begins again in March of 2013. It has been one humdinger of a learning experience for me. It is something I thought of going for yrs but the thought of all that is involved and I would talk myself out of it. But I took the plunge and went for it, I wanted my show on tour before my 66th birthday and as I said, show has been at 4 galleries. With each gallery I learn a few more tricks and some dos and don't s. It has been a wonderful success and as I said, i had a dream and went after it.Your site has given me some ideas about cataloging my new works.Merriest of Christmas to all and Happy New Year. I would like to ask a question if I'm doing a art work or a graphic art work to a company and they buy the artwork but then they want to change some of it. like background or something to that effect. but they make the changes to. what rights do i have on it as i feel if there any changes it should be the artist that should change it. not the company.